Kevin Spacey pleaded not guilty on Monday to indecently assaulting a teenager who alleged that the Oscar-winning US actor groped him in a bar in Massachusetts in 2016. 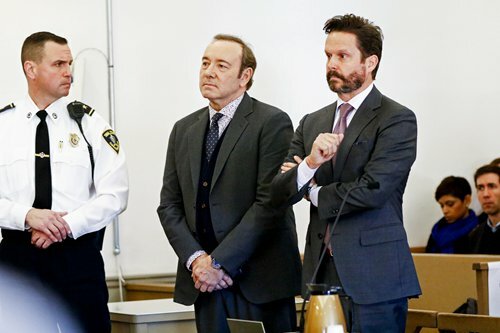 The 59-year-old actor stood quietly with his hands clasped as the clerk read out the charge "that in the town of Nantucket on July 18, 2016 [the defendant] did commit indecent assault and battery on someone 14 and over." They come more than 13 months after the complaint was filed, the latest chapter in Hollywood's reckoning over sexual assault and harassment that has already seen television icon Bill Cosby jailed and movie mogul Harvey Weinstein indicted. Spacey's alleged victim was working as a bus boy for the summer in Nantucket and had remained in the bar after his shift finished to see his hero. After meeting the actor and telling him he was 23 years old - the legal drinking age is 21 in Massachusetts - he said he started drinking first beer and then whiskey at Spacey's urging. The two-time Oscar winner - recognized for his supporting role in Usual Suspects in 1996 and his lead role in American Beauty in 2000 - was considered one of the finest actors of his generation. His career nosedived following allegations of sexual misconduct by more than a dozen men in the US and Britain. Forced out of public life, Spacey posted a video online in December in which he discussed allegations of sexual abuse in character as Frank Underwood, the scheming politician he played in House of Cards before the show dropped him. "You wouldn't believe the worst without evidence, would you? You wouldn't rush to judgments without facts, would you? Did you? No, not you. You're smarter than that," Spacey said in the video. "Of course, some believed everything and have been just waiting with bated breath to hear me confess it all. They're just dying to have me declare that everything said is true and that I got what I deserved. "Only you and I both know it's never that simple, not in politics and not in life." In addition to the Nantucket case, two other investigations are underway in Los Angeles and London, where Spacey served as artistic director of the prestigious Old Vic theater from 2004 to 2015. Mexican actor Roberto Cavazos, who performed in several Old Vic productions, said it seemed that "it only took a male under 30 to make Mr Spacey feel free to touch us." Director Ridley Scott even removed Spacey from his film All the Money in the World (2017) by shooting all scenes in which the actor appeared again with another star, Christopher Plummer.